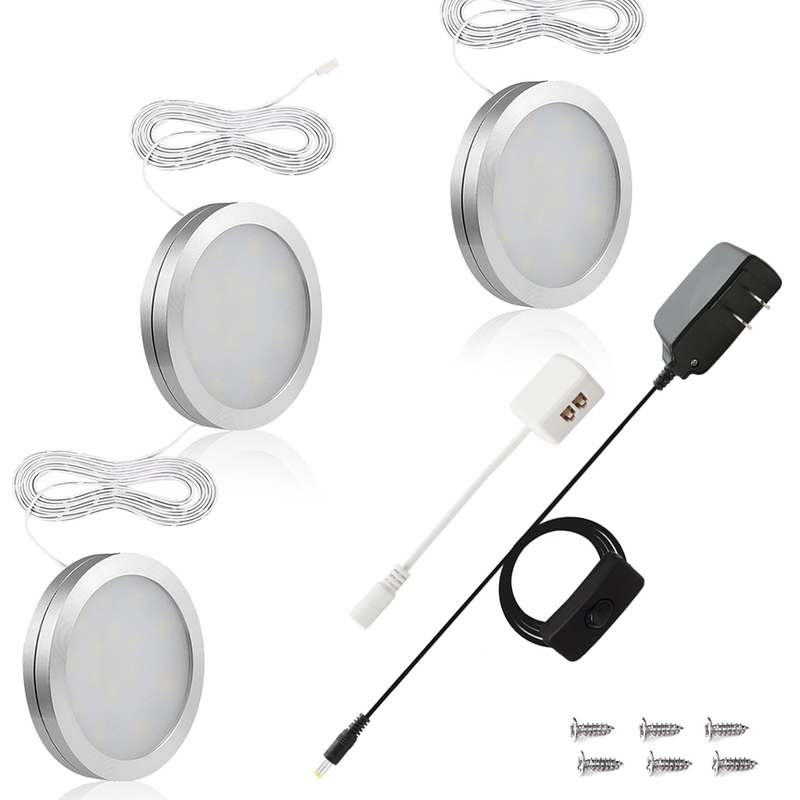 Successfully Added 3 Packed LED Under Cabinet Light Kit to your Shopping Cart. BRIGHT PUCK LIGHTS: 750lm lights would offer bright lighting experience and greatly satisfy your need for normal lighting; Warm white color, harmless to eyes. EASY MOUNTING CABINET LIGHT: Comes with adhesive tapes and screws, peel off adhesive strip and push puck firmly to mounting surface at marked locations, or fixing with screws which would be more reliable. SPLITTER PROVIDED: Connecting most 4 puck lights together with the provided splitter for convenient controlling; All controlled on/off by one button switch at the same time. ELEGANT SHAPE DESIGN: All white color and round shape design with milky shell, simple but great for decoration; Extremely thin for daily use, especially for some dark corners. WIDELY USED LIGHT FOR HOUSE USING: Perfect choice for Closet; Cabinet; Bookcase; Kitchen; Utility Room; Jewelry Display Case; Basement etc.